Good layers and good-natured as well, the Ameraucana breed is one of only three breeds that lays blue eggs. This is a good choice for those who want something simple and easy to manage. Ancona are some of the best layers, producing 5-7 eggs a week, though they have a tendency to be wiler than most and do enjoy a good fly once in a while, making them a bit harder to keep fenced in. 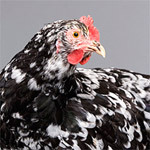 A triple threat, the Barnevelder is great for egg laying, meat production, and even has a following as a show bird. A large bird, they are known to be calm and easy to handle, even consdiered shy by some. Suited best as an ornamental breed, the Booted Bantam is easy to tame to the point of becoming a pet since tehy are calm and very friendly. They come in many varieties of colors. 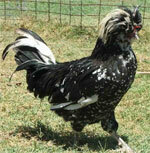 The Brahma can do everything, from lay eggs to become a filling dinner to win awards at a breed show. 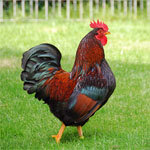 This is one of the largest breeds in the world and is an ideal chicken for newcomers as they're easy to manage. Campines, despite theri small size, make good egg layers, though their primary use is as a show favorite. They love the summer months but don't to welol in winter, though they don't mind confinement. 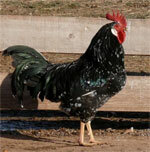 The Chantecler is a native breed from Canada, making them great in the cold but poor in the heat. They're good layers and hardy enough to be good fryers as well. They don't enjoy confinement much. Cochins will eat anything, causing them to be rather large birds. However, they aren't fantastic layers and mature too slowly to be good meat birds. Instead, they're renowned for their unique personalities. Though once known for being a great dual purpose chicken, the Crevecoeur is now best suited as a show bird as it is considered endangered. Despite this, they are calm adn easy to handle. The Havana Brown is a smart, playful, and above all quiet cat that needs human affection to live a happy life. They can adapt to most environments but need attention to thrive. 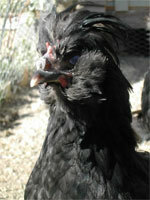 The Dominique breed is consdiered a dual purpose bird, but it excels in egg laying over meat production. They do great in both hot and cold climates and also make good pets. 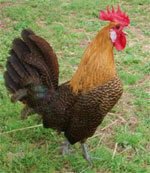 Dorkings are best known for their qualities as meat procuers, though they are capable of laying 140 eggs a year. They can withstand cold weather without any trouble, making them great in the winter. 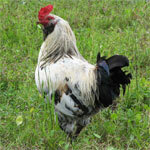 A chicken bred in France, the Faverolles is a dual purpose bird and succeeds as such. Their finely packed feathers allow them to withstand cold climates well and are consdierd the most docile breed in the world. The Fayoumi is best as an ornamental bird, as well as a research subject as they are resistant to many diseases. They are as close as possible to being wild, so they don't make very good domestic birds. Dubbed the "everlayer", Hamburgs lay consistently throughout their whole lives and live pretty long. They are a hardy bird and can withstand cold climates without any trouble. The holland is a dual purpose breed that is bred specifically to lay brown eggs and have yellow skin, as those are preferred here in the US. While not great for teh meat industry, they're excellent for the backyard. The Houdan is loved as a meat bird, loved as an egg-producing bird as they have amazing longevity, and loved as a show bird because of theri unique feathering style. They can do it all! The La Fleche breed is a dual purpose bird with its meat production quality being the main reason for breeding them. They are consiered a very wild breed and like to have space to roam and forage on their own. Lakenvelders are best when they're laying eggs, though they do have delicious white meat, albeit not very much of it. They can easily survive in both hot and cold climates and are considered very intelligent.